Always try to go for an internships abroad. As it will make you realize what is happening around the world and how the students in other countries are studying. Moreover, it will open your mind to search for opportunities for further studies there. It will open up your mind to work hard to reach up to the level of foreign students abroad. 1. Always google keywords such as “Internships”, “International Internships”, “International students internship”, “paid internships for international students”, “internship opportunities for international students”. You will find so many useful results. Just use them. 3. The internships, I mentioned below are just few, more you can find by searching as said above. 4. Deadlines mentioned below can be changed as some programs are not open yet, but dates have been mentioned based on previous year’s deadlines. But previous years deadlines can change, so keep on checking web links yourself. 5. If have any confusion, find emails of concerned persons on desired website and email them and ask. 6. Many internship are lab based, so sometimes you need to contact professors, researchers there. When you contact them, contact in a good way. If you need to send email, make a good email and attach a good CV in PDF form with it. 7. You have to open the links to check if already graduated students can apply or not. 8. You have to open the links to check what year students can apply for it. Such as first year, second year, final year etc. 9. All of the internships mentioned below are mostly fully funded. 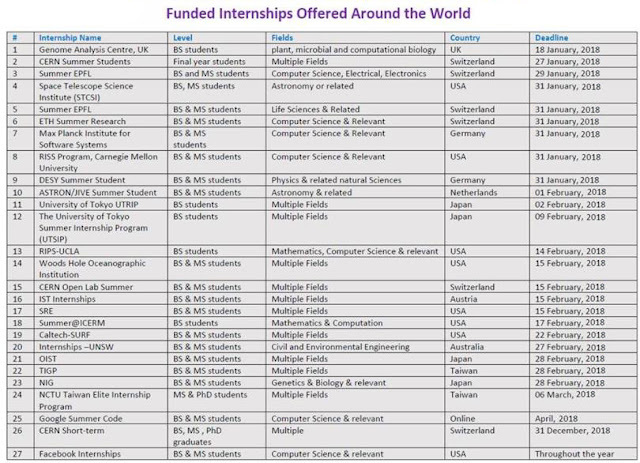 Now, I am giving a list of few possible internships in few countries. This are just few. There are a lot on google. Find the best one for you here or there. The John Innes Centre, The Sainsbury Laboratory and The Genome Analysis Centre provide UK and non-UK students the unique opportunity to spend the summer on their research program in plant, microbial and computational biology. Are you an undergraduate student with a CERN Member State nationality looking for a practical training period during the summer? You have completed, by summer 2018, at least three years of full-time studies at university level. Civil Engineering, Controls and Data Acquisition, Electricity, Electro-mechanics, Electronics, Health, Safety & Environment, Information Technologies, Materials Science & Surface Engineering, Mechanics, Physics. Must be enrolled in a degree program in biology, bio-physics, chemistry, bio-engineering, bio- informatics, quantiative biology, genetics courses or a similar life sciences program and plan on pursuing a career in the life sciences. Basic Life Sciences background is essential. Previous lab experience is a plus. The Computer Science Department at ETH offers a new, exciting program that allows undergraduate and graduate students to obtain research experience in our department during the summer months. Applications for the program are open to students across the globe. The program is committed to increasing diversity in the computer science area. MPI-SWS offers undergraduate and graduate students an opportunity to conduct research at their institute. The program is 12 to 14 weeks long and students are provided with free housing, travel expenses and a stipend. The institute also occasionally offers 6-month long internships. For more details about the application process, FAQs etc. The Robotics Institute Summer Scholars (RISS) Program is an intensive summer research program for talented undergraduate students. Summer Scholars have the opportunity to participate in state-of-the- art research projects, interact with a diverse research team, and to be mentored by leading faculty and technical staff. The program introduces aspiring students to dynamic research resources and methods, RI graduate education programs and research projects. The Summer Scholars program lasts 11 weeks and begins in June and runs until mid-August. Only scholars who are available for the entirety of that time will be considered. The Deutsches Elektronen-Synchrotron (German Electron Synchrotron), commonly abbreviated DESY, is a national research center in Germany which operates particle accelerators used to investigate the structure of matter. It conducts a broad spectrum of inter-disciplinary scientific research in three main areas: particle and high energy physics; photon science; and the development, construction and operation of particle accelerators. Each summer through DESY Summer Student Program, it offers undergraduate students in physics or related natural science disciplines the possibility to participate in the research activities of the laboratory. Selected candidates join in the day-to-day work of research groups at the DESY laboratory in Hamburg or Zeuthen (Berlin) and participate in one of synthesis activities. While the work in the groups is the main activity, so there will be a series of lectures related to the research done at DESY. Visits to the accelerators and experiments are therefore included in this program. Who can apply: Applicants should have completed, by the summer of 2016, three years of full-time studies at university level in physics or related natural science disciplines. About to obtain their Bachelor degree. Having a Bachelor degree and finishing their first year of studies for Master degree or in between these two stages. Applicants who already obtained a master-degree are not accepted. Please take note that due to regulations for paid traineeships in Germany they can only accept students that are enrolled at their university for the whole period of the summer student program. A good knowledge of English is essential. Duration: July 18 – September 7, 2018. The students are expected to stay for the full period. Stipend: 1000 Euros per month + DESY Summer Students will be paid a subsistence allowance to cover living expenses for a single person. Travel expenses will also be subsidized. For more details and to apply, visit DESY Summer Student Program’s page. The online application will open on December 15, 2017 and you can apply till January 31, 2018 this year. ASTRON is the Netherlands Institute for Radio Astronomy. And The Netherlands Institute for Radio Astronomy (ASTRON) and the Joint Institute for VLBI in Europe (JIVE) announce the availability of a limited number of grants for the 2017 ASTRON JIVE Summer Student Program. This program enables astronomy students (graduate or advanced under-graduate) to spend the summer (10-12 weeks) at the Dwingeloo Observatory, conducting astronomical research under the supervision of ASTRON and JIVE staff members. Possible topics of study include radio galaxies and quasars, aspects of observational cosmology, continuum and line emission/absorption from normal and starbust galaxies, faint radio sources, pulsars, molecular clouds, cosmic magnetism, as well as working with LOFAR data. The actual project the successful candidate will work on will be defined after arrangement with the local supervisor. Who can apply: Graduate or advanced under-graduate students of astronomy can apply. The program is not aimed at engineering or electronics students. Stipend: The research grants will provide successful candidates with accommodation in the locality of the Observatory, a modest stipend for up to three months, and full travel reimbursement. For more details, visit ASTRON/JIVE Summer Student Program’s Page. The last date to apply this year is February 1, 2018. · Is a six week summer program for academically motivated undergraduate students. · Provides hands-on research internship opportunities in the fields of natural sciences and social sciences. UTSIP provides a hands-on research internship program in the fields of Information Technology, Biology, Chemistry, Environmental Studies, International Studies, Materials Sciences, Sustainability Sciences, and among others. All participants are assigned to a laboratory in which he/she is interested to work and will conduct a research project under the guidance of a faculty member or senior graduate students. Participants also experience Japanese culture and world-leading Japanese technology through weekend events and a field trip. Who can apply: Participants must have completed a minimum of two years of undergraduate coursework by the start of the UTSIP program. Final and second year students can apply. Everything will be offered in English. Studies, International Studies, Materials Sciences, Sustainability Sciences, and among others. More details here. Duration: 6 weeks in summer 2018. UTSIP Kashiwa will offer two different programs: June 5 to July 14, 2018 and June 26 to August 4, 2018. Accommodation will be provided at student dormitories or lodges affiliated with the University of Tokyo. Accommodation costs will be covered by the University as well. You will be reimbursed after your arrival in Japan. For more details, visit UTSIP’s website. The last date to apply this year is February 9, 2018. The Research in Industrial Projects for Students (RIPS UCLA) Program provides an opportunity for talented undergraduate students to work in teams on a real-world research projects proposed by sponsors from industry or the public sector. RIPS-UCLA is not exactly an REU. It is a research experience, but the projects come from industry rather than academia, so it is essentially a cross between an REU and an internship. Furthermore, IPAM is independent of the UCLA Math department, so RIPS students do not have regular interaction with the Math department. That said, IPAM arranges occasional lectures given by UCLA postdocs and faculty of math and related disciplines, and many of the academic mentors are UCLA math postdocs. There are no classes during RIPS; the focus is entirely on the research projects, and ultimately presenting the results. Who can apply: It is a program for students who are enrolled in or have just completed an undergraduate (bachelors) degree. Students with a strong background in mathematics and an interest in seeing how mathematics is used in the real world are encouraged to apply. Most of the projects have a significant computational component, so that proficiency (or at least some experience) in computer science, data analysis or numerical computation is valuable, but not necessary for everyone. International students, including students attending a university outside the US, are eligible to apply for RIPS-LA, as are graduating seniors. Location: Institute for Pure and Applied Mathematics (IPAM) at University of California, Los Angeles. Stipend: IPAM provides each undergraduate student with a travel allowance and a stipend of $3,000. Housing and most meals are also included. RIPS students will live in residence halls on the UCLA campus and will work at IPAM. For more details and to apply online, visit RIPS-UCLA’s website. The last date to apply is February 14, 2018. Also go through these FAQs. Are you interested in oceanic research? If yes, then this internship will be perfect for you. WHOI conducts a summer student fellowship each year for 10-12 weeks. International students are funded and visa process is taken care of by the institute. Application deadline is February 15th, 2018 Preference is given to students studying in any of the fields of science or engineering including but not limited to the fields of biology, chemistry, engineering, geology, geophysics, mathematics, meteorology, physics, oceanography, and marine policy. Are you a B.Sc. or M.Sc. student (who will have completed at least three years of full-time studies at university level by next spring) in Computer Science or Mathematics, Engineering or Physics with a strong computing profile? Would you be interested in working on an advanced IT project for two full months during the summer? If so, you should apply to the CERN open-lab Summer Student Program! The Institute of Science and Technology Austria, popularly known as IST Austria, is an institute of basic research located in Klosterneuburg, close to Vienna in Austria. Through ISTernship, it offers summer internships to outstanding undergraduate students interested in basic research in Computer Science, Physics, Mathematics, Biology, Neuroscience and interdisciplinary areas. Interns will choose a group to work in, will be assigned a specific project and will conduct research under the close supervision of one of the members of the faculty and, for experimental labs, a lab mentor. Interns will receive an introduction to research at IST Austria as well as an introduction to the IST Austria Graduate School. The program culminates with a research symposium, where the interns present their work to their peers, faculty and lab mentors. Internships are full-time and will be conducted exclusively in English. Who can apply: To eligible for this IST Austria internship, candidates must be enrolled Bachelor or Master Students in good standing at a degree granting institution. They must have completed at least the fourth semester of their bachelor’s studies (before the respective start date). Research Areas: Computer Science, Physics, Mathematics, Biology, Neuroscience and interdisciplinary areas. Duration: 8-12 weeks between May 15 and September 15. Stipend: Salary of 969€/gross/month, travel from and to IST Austria, reimbursement of visa fees, subsidized housing. The last date to apply this year is February 15, 2018. For more details on this internship program, visit Internship’s official page. Students who are either pursuing or have obtained a bachelor’s or a master’s degree in a science subject, and who are interested in doing an internship at IST Austria may apply to the respective group leader directly. The Johns Hopkins University (commonly referred to as Johns Hopkins, JHU, or simply Hopkins) is a private research university in Baltimore, Maryland (United States). And Summer Research Expeditions (SRE) is an intensive, ten-week program to help undergraduates immerse themselves in research and taste the excitement of inventing. SRE is led by faculty members in Computer Science. Participants will be part of a research team, including one or more faculty mentors and/or a graduate student mentor, and will be expected to make contributions to a challenging research topic. Example areas of research include Machine Learning, Natural Language Processing, algorithms for Big Data, Computer Vision and Robotics, Computational Healthcare and Computational Biology. Who can apply: Undergraduate students at four-year institutions are eligible to apply. Few spots are also available for international applicants. Projects: Projects for 2017 have been posted here. Each project has a number assigned to it. Applicants will need to pick their top two project choices and list it on their application. Most projects are purposely open-ended. Once a student has been selected, students may work with their mentors to refine and adapt individual projects to their interest and background. Duration: May 22 – July 28, 2017. Stipend: $4500 for 10 weeks + Housing. For more details and to apply, visit Summer Research Expeditions (SRE), Johns Hopkins University’s page. The ICERM’s Undergraduate Summer Program is designed for a select group of 14-16 undergraduate scholars. Students work in groups of two or three, supervised by faculty advisors and aided by teaching assistants. The faculty advisors present a number of interesting research topics that are centered around deep mathematical structures hidden in the everyday objects. The areas where the problems lie are dynamical systems and low-dimensional topology, but the origins of the problems themselves are mundane: how to find a gap in a fence? How complicated should be your finger movements to tie a knot? Why standing waves develop in crowds? To crack the problems will require both ingenuity and computer experiments. Students form research groups to work on these problems, give talks about their findings, and write up their research into a paper at the end of the program. The Institute for Computational and Experimental Research in Mathematics (ICERM), founded in 2011, is a research institute in mathematics at Brown University, funded beginning in 2010 by a grant from the National Science Foundation. Who can apply: Applicants must not yet have graduated with an undergraduate degree at the time of the program start. Funding is available for a limited number of students who are not US citizens or permanent residents. Location: Providence, Rhode Island (United States). Duration: 8 weeks (June 19-August 11, 2017). Stipend: $3,000 stipend + Travel support within US + Dormitory housing + Meal plan. For more details on this program, visit ICERM’s website. The last date to apply this year is February 17, 2018. The California Institute of Technology (commonly referred to as Caltech) is a private research university located in Pasadena, California, United States. And Caltech SURF (Summer Undergraduate Research Fellowships) program introduces students to research under the guidance of seasoned research mentors at Caltech and JPL. Students experience the process of research as a creative intellectual activity. · Be a continuing undergraduate student. · Have a cumulative GPA of at least 2.5/4.0. · Complete the second semester or third quarter at your college or university. Additional Requirements for Non-Caltech International Students: International students are eligible to participate in SURF on the Caltech campus; however, only US citizens and US permanent residents are eligible for SURFs at JPL. Projects: In case you are a continuing undergraduate (second or third year in case of BE/B.Tech) student, then as an international non-Caltech student, you can apply only for projects at Caltech campus only not JPL. You can check the list of projects here. **Repeating. As an international non-Caltech student, you can apply only for projects at Caltech campus only, not at JPL. Plus some projects at Caltech campus are open only to Caltech students. If an AO is NOT open to non-Caltech students, please DO NOT contact the mentor. More projects will be posted in next 1-2 months. Please check the projects page regularly for new AO submissions. You can apply for more than one project, but do so with caution. One of the criteria used in assessing your application is your enthusiasm for the project. If you apply to more than one project, your enthusiasm for each can be questioned. If you choose to apply to more than one SURF, please inform each of your prospective mentors that you are pursuing other SURF opportunities. Location: California Institute of Technology, Pasadena, California (United States). Duration: Around 10 weeks. The Caltech SURF start date is June 14. All students must begin by July 10, 2018. If you have compelling reasons for needing an alternate start date, you must make a request to your mentor and then a final request to the SFP Office. If SFP approves your request, you must start on one of the approved alternate start dates. All students must begin by July 11. Stipend: Fellows receive a $6,000 award for the ten-week period. Award payments will be distributed in equal installments in late June and late July. Housing is available for non-Caltech students working on campus or at JPL during the summer under one of the programs coordinated by the Student-Faculty Programs Office. The cost of housing, however, is not part of the SURF award; students must pay for housing themselves. How to apply: To apply, identify a project and contact its mentor in advance of submitting an application. A mentor must agree to support your application and collaborate with you to develop and define the research project and write and submit a research proposal. This early interaction is a very important part of the application process. Non-Caltech students usually have to accomplish this discussion via email, phone, or fax. For more details and to apply, check the Caltech SURF’s website. The last date to apply this year is February 22, 2018. The University of New South Wales (UNSW) is an Australian public research university. And it is inviting applications from Civil and Environmental Engineering students for internships in its School of Civil and Environmental Engineering. The objective of the UNSW internship program is to attract the best and brightest students from across the world into the School, who may be interested in pursuing research careers and PhD studies and developing collaborations. Who can apply: Those who have completed 2 or 3 years of study at undergraduate level to work with strong research groups at UNSW for a 8-week duration each year. Masters students and students who have completed 4+ years of study may also apply. Location: University of New South Wales (UNSW), Australia. Duration: 8 weeks (Starting mid May 2018 or later). 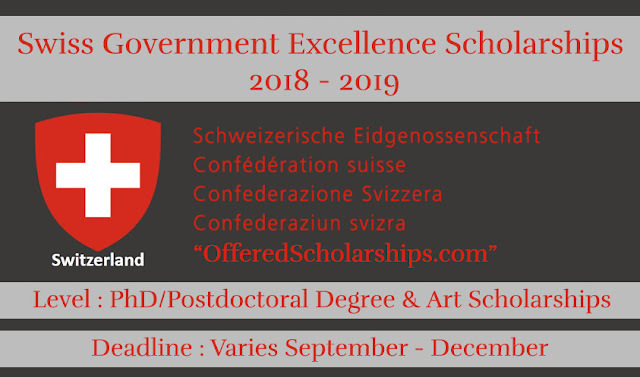 Stipend: Each successful applicant will be awarded a stipend of AUD 1,800 per month (or fraction thereof) which will be provided as a two-weekly allowance. Successful interns MUST bring with them sufficient money (about AUD 1,000) to meet accommodation and living expenses as scholarship payment processing takes about 4 weeks. You will have to arrange your own air fares, flights and visas. For more details on these internships, visit Internships – School of Civil and Environmental Engineering, University of New South Wales’s page. Your applications should reach them latest by February 27, 2018. You can download the application form for this internship from this page. OIST offers research internships for undergraduate and graduate students from all over the world. These research internships give students the opportunity to work in a lab and conduct research under a professor’s tutelage. The duration of the internship is 10-12 weeks. Students receive a living allowance of 2400 JPY per day. Research interns are admitted four times a year. The National Institute of Genetics is a Japanese institution founded in 1949. It hosts the DNA Data Bank of Japan. And National Institute of Genetics (NIG)/Department of Genetics, SOKENDAI offers a 6 week research internship program called NIGINTERN for students who wish to gain research experience in genetics and related fields in life sciences. Intern students will conduct independent research under the mentorship of participating faculty at NIG. Their program includes training on scientific research, scientific communication and lab visits to discuss with individual faculty. At the end of the program each students will present their experience in the “NIGINTERN Reports Symposium”, and NIG will issue a certificate to those who has successfully completed the program. Interns can also participate in various activities, such as lectures of our graduate program, journal clubs, and seminars by outstanding researchers in and out of NIG. Japanese lessons are also available. Who can apply: Prefinal year undergraduates (3rd year of 4 year Bachelor course, 4th year of 5 year Master/ Bachelor dual-degree course) or 1st year students of 2 year master course at the time of application who are interested in life sciences can apply for this NIG internship program. Location: National Institute of Genetics, Japan. Duration: 4 weeks (June 26 – August 4, 2017). Stipend: NIG will cover costs of airfare, local transportation between airport and NIG, lodging in the institute’s guesthouse, and travel insurance during the program. Allowance for meals (ca. 1,500 JPY/day, subject to change) will also be provided. For more details, visit National Institute of Genetics (NIG), Japan Intern Program’s page. The last date to apply this year is February 28, 2018. You can check the students who were selected in 2016 here. The NCTU Taiwan Elite Internship Program provides an opportunity to Master or PhD students from partner universities of National Chiao Tung University, Taiwan and other renowned foreign universities to participate in short-term research at NCTU. while Computer Science ranks 35th world-wide (based on Shanghai Jiaotong University’s Academic Ranking of the World Universities in 2013). Through this NCTU internship, faculty members with various specialties (in the areas of engineering, social science, computer science, biological science, electrical and computer engineering or management, etc.) from different colleges of NCTU participate in the program and invite prospective students to do research. The students conduct research on either a small independent project or assisting an ongoing project in the host laboratories. At the end of the research, the interns submit a report regarding their research work at NCTU. Who can apply: Master or PhD students from partner universities of NCTU and other renowned foreign universities can apply. Applicants from the partner universities of NCTU are preferred. Streams: NCTU consists of nine colleges, ranging from Science to Electrical Engineering to Computer Science to Management/Social Sciences. You can check the departments of NCTU here. Duration/Next Batches: Atleast 2 months. Batch starting May 8, 2018: Deadline for the same is March 6, 2018. Batch starting August 7, 2018: Deadline for the same is June 5, 2018. Stipend: Free round-trip economy class flight ticket from your home country to Taiwan + additional NTD 5,000 scholarship (including 6% tax) for the first month in NCTU. During the research period, you will have to born extra expenses such as extra accommodation fees, insurance, food, travel etc. For more details on this internship program, check this PDF notification. Please note that the applications for Google Summer of Code for summer 2018 will open on March 20, 2018 but the advance notice is for you to get sufficient time to prepare for your applications. Google Summer of Code (GSoC) is a global program that offers students stipends to write code for open source projects. Through Google Summer of Code, accepted student applicants are paired with a mentor or mentors from the participating projects, thus gaining exposure to real-world software development scenarios and the opportunity for employment in areas related to their academic pursuits. In turn, the participating projects are able to more easily identify and bring in new developers. Best of all, more source code is created and released for the use and benefit of all. Who can apply: Pretty much anyone with a brain and heart of a program, must be a full or part time student, and 18 years or older. You can submit up to five proposals/apply for maximum 5 projects. However, only one per student may be accepted. No more than one proposal per student will be accepted, no matter how many proposals you submit. Location: This is a remote (work from home) internship. All development occurs online; there is no requirement to travel as part of the program. Duration: Around 3 months (May 30-August 29, 2017). Stipend: $5,500 for around 3 months of work. Here is a link to the Google Summer of Code’s website. Check the timelines of Google Summer of Code 2018. Also follow Google Summer of Code on Quora. The applications for Google Summer of Code for summer 2018 will open on March 20, 2018 but the advance notice is for you to get sufficient time to prepare for your applications. CERN offers a limited number of internships to undergraduate students for practical training assignments. The students mostly have technical or administrative backgrounds and their university requires or encourages them to spend a training period in industry or in a research establishment. The traineeship must form part of candidates' studies. Facebook internships are one of the most sought after internships and the best you can get. Like every other company, Facebook visits the best colleges of India and hires interns directly through its campus recruitment. That is the best way to get a Facebook internship. But if your college is not one of them, then you can apply online for Facebook internship positions. Facebook hires interns for a variety of roles like software engineering, business, UI/UX etc. and the internships are filled on rolling basis. They don’t have fixed deadlines unlike the research internships you have come across but are open until they find a suitable candidate. So you are suggested to apply as soon as possible. Location: Facebook offices in the US including the Menlo Park HQ. You can check and apply for the different Facebook internship postings on its university portal here. And here is a link to the software engineering internship’s page for summer 2018. Apply ASAP. The earlier you apply, the better! Also follow Facebook internships topic on Quora. Thanks to Waqar Baig for such a precious information. Hi. Great job for this compilation. I was wondering if you have information about short courses or other opportunities for a mid-career Architect interested in green architecture and sustainable materials. Thank you. Will share it with you if I found something like that. Hi, thanks a lot for now this amazing information. Do you have any idea about medical internships?